What is all the coconut water hype about? This “miraculous” hydration drink has exploded in popularity in the last few years. You’ve probably seen it at yoga studios, gyms and even at grocery store checkout lines. Coconut water companies claim that coconut water is the BEST, all natural way to hydrate. Better, in fact than pure water due to it’s high electrolyte content. Truth or myth? Is this something that athletes should be stocking their fridges with and guzzling after a good sweat? Is this truly a natural alternative to sports drinks? Unfortunately for those of you living in northern climates, the truth is that coconut water is really only good for you when it’s fresh, straight out of the coconut. Coconut water is the juice from inside a green coconut and it can be tasty stuff! In fact, fresh coconut water is not only a wonderful way to hydrate (it is one of the highest sources of electrolytes known to man) it is also a powerful healer for the body. The chemical compounds of coconut water are so similar to human blood plasma that it is a universal blood donor (plasma makes up 55% of human blood). Coconut water has saved many lives. And here in the tropics, fresh coconuts are plentiful! There’s nothing like a fresh, cold, coconut right after surfing session or a trail run through the jungle. However, if you’re drinking coconut water out of a can or bottle that you bought at your gym you’re not doing your body many favors. 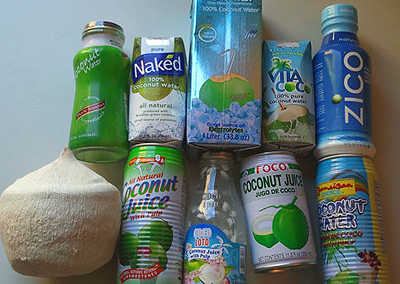 Packaged coconut water has been pasteurized or “flash” pasteurized (required by the FDA), which not only kills all the potentially harmful bacteria, but also kills the good stuff in the process, significantly diminishing its nutritional value. While coconut water fresh from the coconut is alive and nourishing to every cell in your body, packaged coconut water offers dead, somewhat empty calories. Furthermore, when it comes to electrolytes specifically, studies show that several major brands of coconut water have tested well below “promised” levels of electrolytes such as sodium. If you’re an endurance athlete who is doing a lot of sweating and you’re looking for drink that will hydrate and replace electrolytes, then relying on bottled coconut water is not a great idea. In fact, when you drink packaged coconut water you may be confusing your body and impairing your performance as an athlete. That’s not what we’re looking for here! For those of you that live in a northern climate and love coconut water, sorry for the bad news! Moderation is a good way to go here. Think of coconut water as something to treat yourself with occasionally, instead of your go to hydration drink post workout. 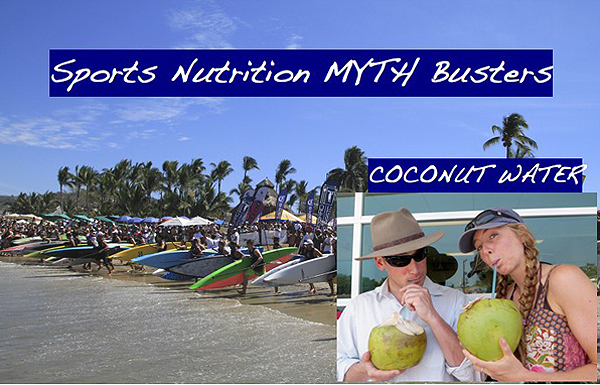 So, if coconuts aren’t the hydration miracle we’ve been searching for, what is? What’s the big deal about electrolytes? Why are these important for athletes? Do you know when your body needs electrolyte replacement? Is clean, pure, water enough for hydration? What kind of hydration drink works best for your unique body? These questions will get you started thinking like a holistic athlete. Athletes should have a solid understanding of what you need to be doing to re-hydrate the body. There is no one size fits all way of hydration. My upcoming online program “Sports Nutrition with a Holistic Twist” is going to give you the tools you need to figure out what works for you! Official online program begins June 17th. Early bird discounts available for early sign ups! Parting Thought: Don’t give up on coconuts! Though coconuts might not be the best way to hydrate if you’re living in the north country, that doesn’t mean they’re all bad! Coconut oil and coconut flesh can actually be wonderful additions to your diet. In fact, coconut oil is a superfood that can boost athletic performance to the next level when used properly. More on this in my upcoming sports nutrition program! What is “Sports Nutrition with a Holistic Twist?”. Check out this short video!